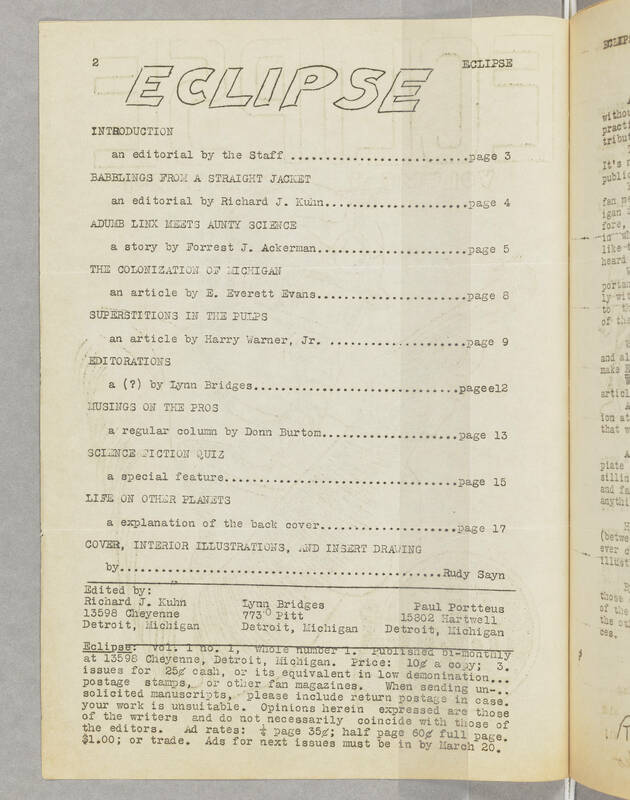 2 ECLIPSE ECLIPSE INTRODUCTION an editorial by the Staff .......................page 3 BABBLINGS FROM A STRAIGHT JACKET an editorial by Richard J. Kuhn................page 4 ADUMB LINX MEETS AUNTY SCIENCE a story by Forrest J. Ackerman.................page 5 THE COLONIZATION OF MICHIGAN an article by E. Everett Evans...................page 8 SUPERSTITIONS IN THE PULPS an article by Harry Warner, Jr. .....................page 9 EDITORATIONS a (?) by Lynn Bridges...................pagee 12 MUSINGS ON THE PROS a regular column by Donn Burtom..................page 13 SCIENCE FICTION QUIZ a special feature..........................page 15 LIFE ON OTHER PLANETS a explanation of the back cover....................page 17 COVER, INTERIOR ILLUSTRATIONS, AND INSERT DRAWING by...............................................Rudy Sayn ____________________________________ Edited by: Richard J. Kuhn 13598 Cheyenne Detroit, Michigan Lynn Bridges 773 Pitt Detroit, Michigan Paul Portteus 15802 Hartwell Detroit, Michigan _______________________________________ Eclipse: vol. 1 no. 1, whole number 1. Published bi-monthly at 13598 Cheyenne, Detroit, Michigan. Price: 10¢ a copy; 3. issues for 25¢ cash, or its equivalent in low demonination... postage stamps, or other fan magazines. When sending unsolicited manuscripts, please include return postagein case. your work is unsuitable. Opinions herein expressed are those of the writers and do not necessarily coincide with those of the editors. Ad rates: 1/4 page 35¢; half page 60¢ full page. $1.00; or trade. Ads for next issues must be in by March 20.